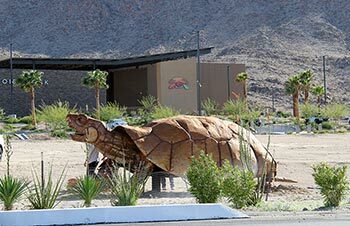 Tortoise Rock Casino is the newest entertainment destination in Twentynine Palms, California. Owned and operated by the Twenty-Nine Palms Band of Mission Indians, the casino is beautifully situated between the majestic Joshua Tree National Park and one of the world’s largest military training facilities—the U.S. Marine Corps Air Ground Combat Center. The casino offers 30,000 square feet of gaming space, with 490 Slot Machines, 7 Table Games, live poker, plus live entertainment, Oasis Grille and Shelly’s Lounge. Open daily on Baseline Road between Adobe Road and Utah Trail in Twentynine Palms. “Live at the Rock” at Tortoise Rock Casino! The FREE Friday Concerts kick off Friday nights in March and continue through October. Concerts are performed on the outdoor stage at Tortoise Rock Casino and feature exciting tribute bands and artists. All concerts are free and take place on Friday night beginning at 8 p.m. The concerts are presented by Z107.7 FM, and listeners are encouraged to tune in regularly to listen for updates and announcements for the Live at the Rock series. Before enjoying the concert at Live at the Rock, start off the night with a bite to eat at Oasis Grille or enjoy a cocktail at Shelly’s Lounge. The casino also offers sports-viewing events, DJ music Friday and Saturday nights, Ladies Night specials on Karaoke Wednesdays, slot tournaments on Thursday nights, and Sunday Senior specials. Tortoise Rock Casino can be found by taking a right on Adobe Road at Highway 62 going south several blocks to Baseline. Everyone 18 years of age and over can join the non-stop gaming action at Tortoise Rock Casino.Visit www.TortoiseRockCasino.com for more information or call 1.866.377.6829. The Twenty-Nine Palms Band of Mission Indians also owns and operates Spotlight 29 Casino in nearby Coachella, California.